A new report released today by the World Health Organization and the European Centre for Disease Prevention and Control (ECDC) found that while overall tuberculosis (TB) mortality and incidence rates have steadily fallen in the European region over the past decade, the disease should not be “underestimated.” The report warns that these rates are not sufficient to reach global targets for reducing the disease, further noting that while the European region may have only 2.8 percent of the world’s TB burden, it has 23 percent of the world’s burden of multi-drug resistant TB (MDR-TB). 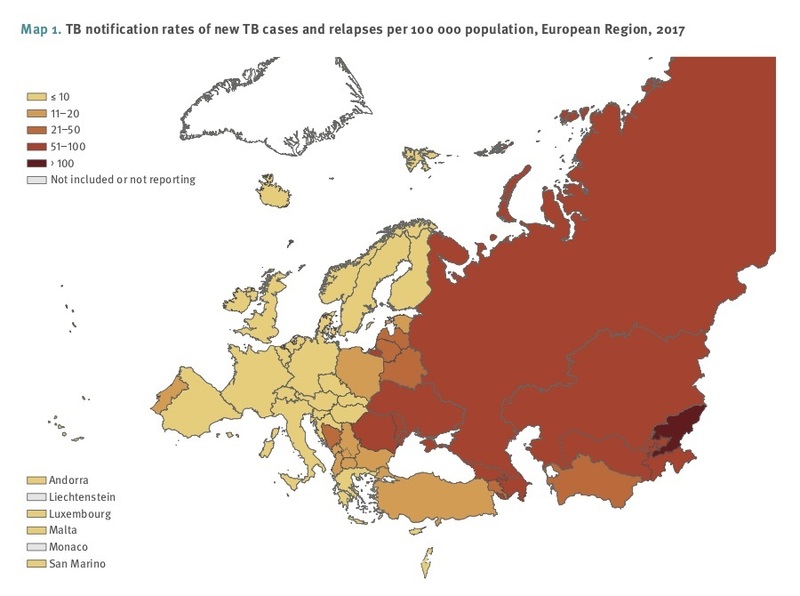 The report, Tuberculosis surveillance and monitoring in Europe 2019, uses 2017 data to provide an overview of the latest TB epidemiological situation. From 2008 to 2017, Europe saw a steady decline in TB incidence by an average of 4.7 percent annually. In 2017, the number of TB cases stood at 275,000, which corresponds with 30 cases per 100,000 population and 2.8 percent of the total burden of TB in the world. Of the 275,000 TB cases in 2017, the report found an estimated 77,000 people had rifampicin-resistant and multidrug-resistant TB (RR/MDR-TB), which represents 23 percent of the 330,000 global RR/MDR-TB burden. The report also found that the distribution of the disease is uneven, with the 31 countries in the European Union/European Economic Area (EU/EEA) faring much better than the 23 non- EU/EEA countries in the region. The report estimates that the number of TB cases with an HIV coinfection was 12 percent in 2017, with the highest proportions of TB cases coinfected with HIV occurring in Ukraine at 21.6 percent, followed by the Russian Federation at 20.9 percent. The report also highlights the need to fill gaps in data, particularly for rates of HIV-coinfection and for prison populations, recommending greater collaboration with HIV-testing agencies and universal TB testing for prison populations. “TB is preventable and curable; the time to take action is now to end TB by 2030. If we don’t act rapidly and decisively, the drug-resistant forms of the disease will increase their hold on Europe,” Zsuzsanna Jakab, regional director for WHO Europe, said in an ECDC press release. While advances have been made in the treatment of MDR-TB with safer and more effective drugs, in 2017 “only 45% of patients with MDR-TB were treated successfully, and for extensively drug-resistant TB (XDR-TB), the more resistant form of the disease, only 28% were reported as successfully treated,” the release notes. In September 2018, the United Nations held a High-Level Meeting on TB at which heads of state and ministers of health made political commitments [pdf] towards the fight against TB. “This brought hope to the world as global leaders stepped up their commitment to end TB by 2030, in line with the Sustainable Development Goals (SDGs). This political commitment now needs to be translated into action to end TB,” the release says. The 18 high-priority countries (HPCs) in the WHO European Region with higher rates of TB are concentrated in the eastern part of the region, and are composed largely of countries not in the EU/EEA. These HPCs include Armenia, Azerbaijan, Belarus, Bulgaria, Estonia, Georgia, Kazakhstan, Kyrgyzstan, Latvia, Lithuania, Moldova, Romania, Russia, Tajikistan, Turkey, Turkmenistan, Ukraine and Uzbekistan. 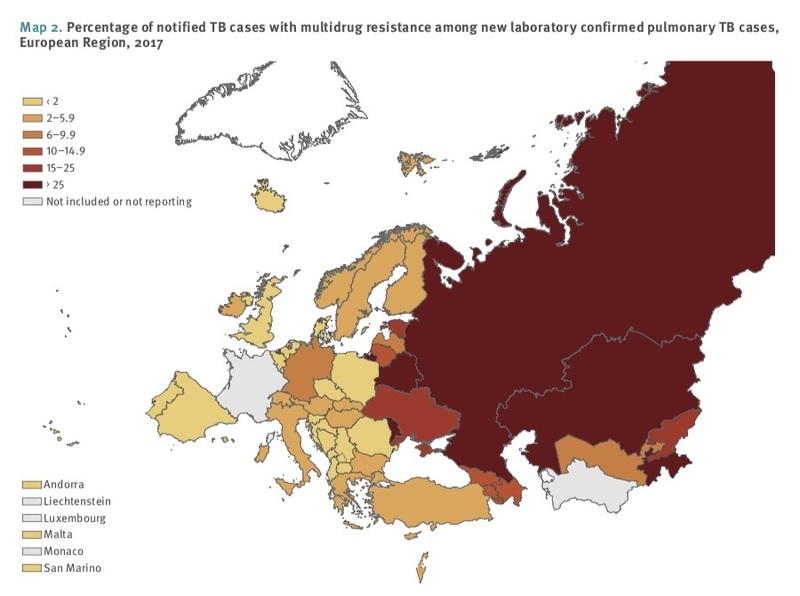 “The six countries with the absolute number of incident TB cases over 10 000 were the Russian Federation (86 000), Ukraine (37 000), Uzbekistan (23 000), Romania (14 000), Turkey (14 000) and Kazakhstan (12 000),” the report says. “The TB mortality rate was highest in Turkmenistan (9.9 deaths per 100 000), followed by Ukraine (8.7) and Azerbaijan (8.7). Together, the 18 HPCs accounted for over 83% of TB deaths in the Region,” it says. The “considerable variation” in the incidence of TB and MDR-TB is illustrated in the maps from the report below. Image Credits: ECDC, WHO / ECDC.